Cover Home: 740 Manor Drive, Reno, NV 89509 NNRMLS #190003756 For more information about the real estate market, or to search for homes, visit DicksonRealty.com. 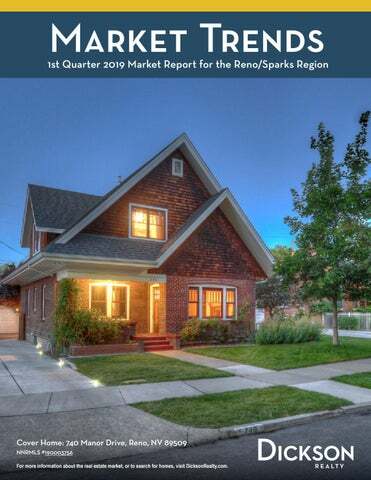 Reno/Sparks Market Overview Reno/Sparks area REALTORS sold 448 single family homes in March, which was 87 more than February, but 101 fewer than March of last year. It is good to see an increase in sales after a slow start to the year. A combination of rising prices, especially wintery weather in January and February, and the continued lack of inventory in the most affordable price ranges are the biggest contributors to the lower number of sales year over year. There were 851 homes active on the market at the end of March, which was a 5.97% decrease from February, marking the 6th consecutive month with lower inventory. Although we had a decrease month to month, inventory is up by over 20% year over year. Over two-thirds of the available inventory on April 1st was priced below $600,000. The median sold price for single family homes in Reno/Sparks, at $369,450, was an inconsequential .7% decrease over the last month and nominal decrease of 1.5% compared to March 2018. “Median” means “in the middle”, so half of homes sold for less and half sold for more. An annualized upward trend in median price is expected for the foreseeable future. Average Days on Market for homes sold decreased by 3 days to 103 days in March. This marks the first decrease of days on market in nearly a year. Last year at this time days on market was 83 days, which is 24% lower. The Days on Market that we see today still represents a very fast paced market. It is important to be pre-qualified with a lender before looking at homes to buy. Pre-qualification will help ensure you are prepared to make an offer when you find that perfect house to call home. If you do not have a preferred lender, contact your Dickson Realty agent for a recommendation. Whether buying or selling in today’s complex real estate market, having a professional real estate agent on your side can help you buy or sell at the best price. I’M LOCAL. WE’RE GLOBAL . LOCAL EXPERTISE, GLOBAL CONNECTIONS, POWERFUL MARKETING. WE MARKET YOUR PROPERTY TO THE WORLD. 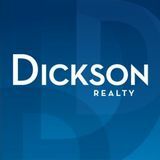 When selling your home, you need global exposure in addition to the strong marketing expertise that Dickson Realty delivers locally. As an affiliate of Leading Real Estate Companies of the World,® we have the resources to market your property to the highest possible number of potential buyers. With 130,000 talented associates around the world, we expose your property to buyers on six continents ensuring more eyes on your property. In addition, we receive inbound clients from other affiliates around the globe who are interested in purchasing a home. Leading Real Estate Companies of the World® is a pedigree denoting the very best companies who represent qualified clientele and wish to do business with similar firms. Each year our network is collectively responsible for over one million transactions on a global basis. When your home is posted to our website locally, it is immediately promoted on the LeadingRE.com website. It is also immediately connected to the websites of over 565 of our affiliated real estate firms in the world. No two homes are identical, which is why choosing a sales price or offer price for a home can be challenging. While convenient and sometimes relied upon by home shoppers, online estimates are often not accurate, because a computer algorithm alone cannot adjust for a recent remodel project or a view that neighboring homes may not have. That’s where your local real estate professional and the Comparable Market Analysis, or CMA, can be useful. WHAT IS A CMA? The CMA is a side-by-side comparison of homes for sale and homes that have recently sold in the same neighborhood and price range. This information is further sorted by data fields such as single-family residence or condo, number of bedrooms, number of baths, zip codes, and many other factors. Its purpose is to show fair market value, based on what other buyers and sellers have determined through past sales, pending sales and homes recently put on the market. HOW IS THE CMA CREATED? CMAs are generated by a real estate professional and the local multiple listing service (MLS). The MLS is available to licensed members only, including real estate brokers, salespeople, and appraisers, who pay dues to gain access to the service’s public and proprietary data, including tax roll information, sold transactions, and listings input by all cooperating MLS members. Listing agents generate CMAs for their sellers, and buyer’s agents create them for their buyers so both sides know what current market conditions are for the homes they’re interested in comparing. HOW ACCURATE IS A CMA? The CMA is a here-and-now snapshot of the market, based on the most recent data available, but it can instantly be rendered obsolete by a new listing, or a change of status in a home with the same criteria. Why? The market is constantly changing – new listings, pending sales, closed sales, price reductions, and expired listings. CMAs can vary widely, depending on the knowledge and skill of the person inputting the search parameters to the software as well as the number and type of data fields that are chosen. That means some features may not be included. As informative as the CMA is, it should only be used as a tool and should not substitute for a real estate professional’s knowledge and advice. © 2019--- Dickson Realty. All rights reserved. Although the information above is deemed reliable, Dickson Realty does not guarantee its accuracy. If your property is currently listed for sale, this is not intended to be a solicitation.